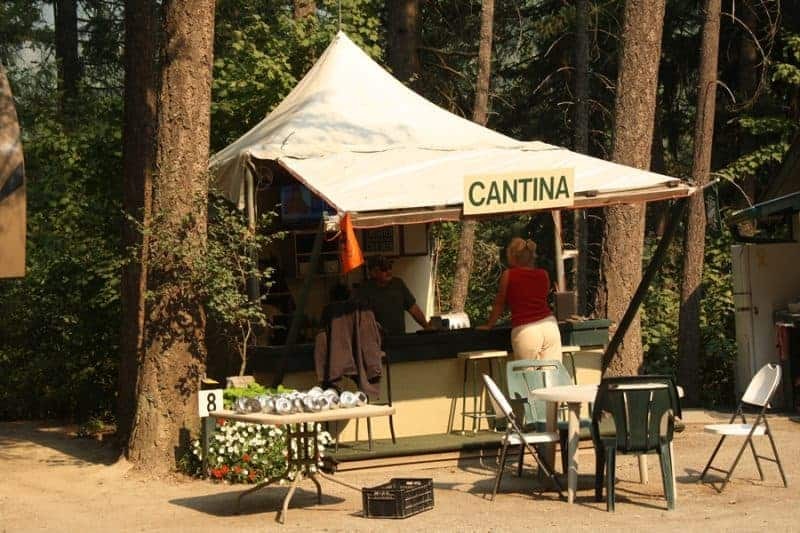 Along the Canada-USA Border, traveling Highway #3 East in southern British Columbia region of Canada sits a real gem of a forested campground called Mountain Park Resort. The Creston BC campground sits, high up, on the banks of the Goat River in Creston, BC, Canada. The camping resort is a great model to follow for campground cleanliness, convenience, hospitality and good times. John and Pam, the owners of the Creston BC campground, have done an outstanding job maintaining and operating their campground. Their good nature makes it an ideal atmosphere for those with families and for those who seek privacy and/or meeting new people. We are excited to introduce you to Mountain Park Resort during our recent road trip to Creston BC while exploring the southern highways of British Columbia, Canada. Forested campsites down main street Mountain Park Resort. 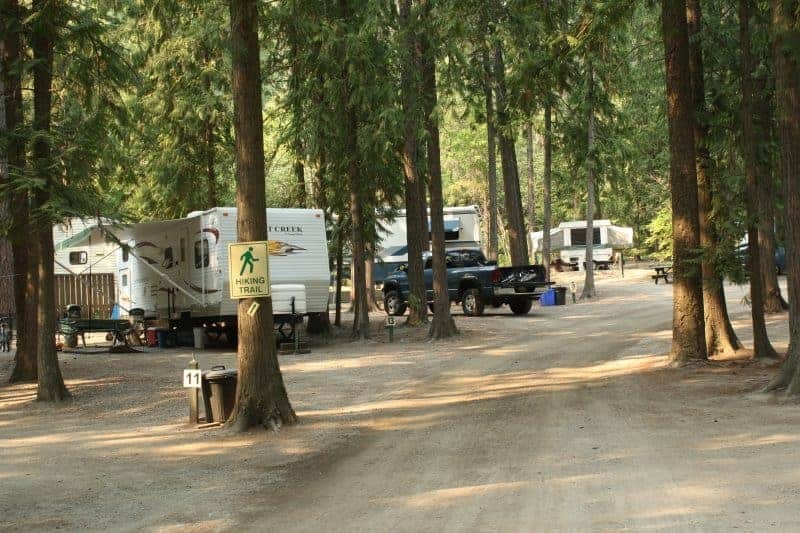 The Creston BC campground consists of a mix of RV and some tenting campsites. The campsites are well kept, watered and swept (watch the video and you’ll get it). All are decorated in forests and there are 40 in total. In the centre court of the Mountain Park Resort is the general meeting area for campers. This is so well done and thought out. Here campers find the bathrooms and showers, as well as, the outdoor stage, playground and a Cantina. Yes, you heard me right, a Cantina. It is one sweet set-up too. The Cantina is a tent-like structure with tables and chairs. It looks like something you would see on a remote tropical beach. The hut is the general gathering place for campers to meet, greet and entertain. Cantina at the Mountain Park Resort. To us it is pretty simple. Good hosts, great vacation. Bad hosts, the spoiler is on. No matter how good an accommodation or campground, the Host can make or break a vacation. It is that simple. Hence, why we take great pleasure when we meet good people in the tourism industry. People who are good with people, easy to talk to, interesting, happy, motivated, hard working and/or funny. People who WILL give you the time of day. Pam and John of the Mountain Park Resort are exceptional people who make the time to talk with you, laugh with you and even have some fun teasing you too. Fun aside, they are also a great resource for Creston adventures and nearby day trips. The Maple Leaf RV has landed at the Mountain Park Resort. As base camps go, Mountain Park Resort, covers a lot of bases. First and foremost, close and easy access is always a good thing. From the Creston BC campground there is a trail leading down to some adventures on the Goat River. How cool is that right! Pack up some blankets, liquids and food and take the 1 or so kilometre trail down to the river bank. It is there you have choices. Relaxing in a rock pool in the Goat River. At the river one can either lounge out on the big boulders sunbathing or cool off sitting in a self-made rock pool or go for a swim in one of the protected quiet-water pools. If scenery is your thing, there are rapids and cliffs to photograph. Maybe, even a wildlife sighting if you are lucky. It does not stop there either. One can fish and even gold pan on the Goat River in Creston, BC, Canada. Time your visit right to Mountain Park Resort and one can camp, eat and be entertained all in one. Every year the Creston BC campground holds events on their outdoor stage. The next one is a pig roast, camping and entertainment on the September 1st, 2018 long weekend. There is still time. Mountain Park Resort is able to also accommodate weddings, family reunions and other group events. Good idea to get on this right away to ensure your spot. A “Star of Tourism” recipient. 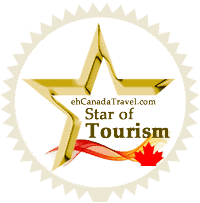 The “STAR OF TOURISM” badge is awarded to Canadian accommodations, campgrounds, attractions, restaurants and/or adventures who, after a visit from the eh Canada Travel team, are singled out and identified as good people providing top quality tourism hospitality. We are hitting the road Canada! We are due too! 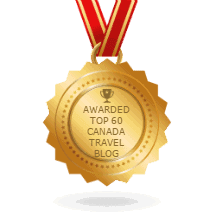 Our Maple Leaf RV will now be our vehicle of choice for transportation when exploring from destination to destination handing out “Star of Tourism” Awards. We will also be presenting to tourism groups, consulting communities and, hopefully, doing a lot of public speaking sharing our combined 40 years of online internet tourism experience helping communities. Our road trip is dubbed #ehroadtrip on social media. Follow us for our travel routes and road trip schedules. 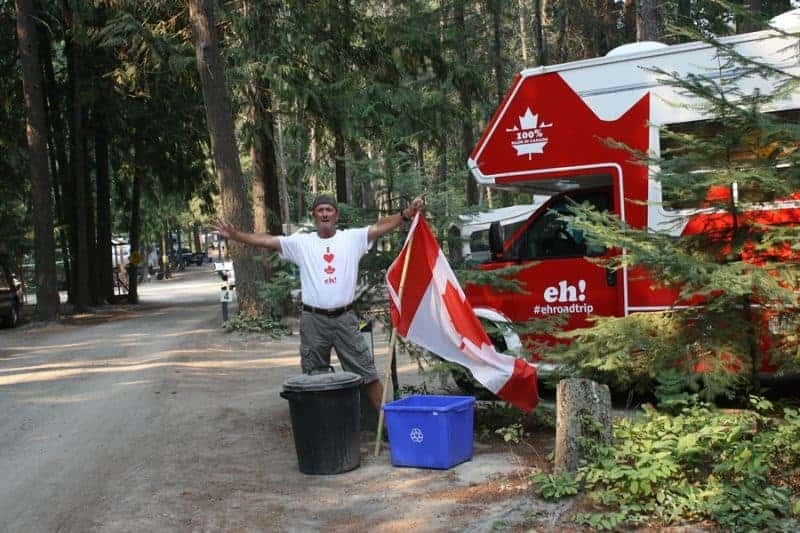 Watch for the Maple Leaf RV in your community. Come and say Hi.